This personal portfolio theme by Ryan Downie was originally designed for his own personal use – fueled by his passion for Coffee, Red Bull and lunchtime pot of noodles according to his Twitter stream. It’s perfect for anyone wanting a bold design to show off their work. Deliver your message to your visitors with a bold Yanone Kaffesatz font and show of your latest portfolio item. 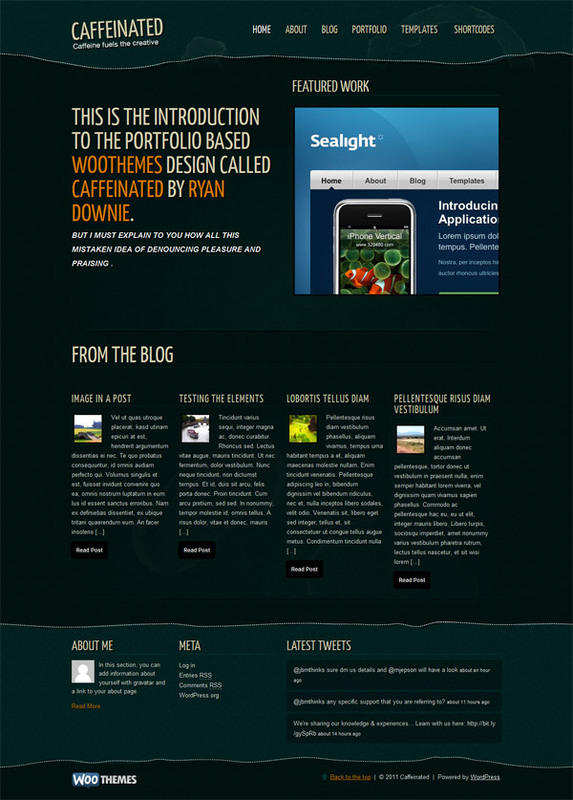 Also includes your blog posts nicely and has a footer widget area. A portfolio page template to show off your work, which utilizies jQuery prettyPhoto script for added effect. Upload multiple images per portfolio item to show in a lightbox. The portfolio items are delivered through the all new Custom Post Type functionality in WordPress 3.0, so it is easier than ever to add new posts. The theme has 3 widgetized areas in the footer, and as always comes with custom Woo Widgets (Ad Space, Blog Author, Embed, WooTabs, Search, Flickr, Twitter). The theme includes 7 alternative color styles which you can preview in the demo. Making simple changes without editing code, like adding your own logo, changing to an alternate color style, adding Google Analytics code, couldn’t be easier with the theme’s backend options panel. The theme is tested to ensure it is compatible with all the modern web browsers like Firefox, Safari, Chrome and Internet Explorer. An image resizer script is built into the theme framework that automatically scales your post images for pixel perfect display in the template. No need to upload new cropped images when re-designing your website. It also comes packaged with a .po file for easy WordPress theme translations into your desired language – editing one neat little file without hunting down text in all our theme templates.